Several website designers and developers even the most experienced ones look for Bootstrap admin templates with dark themes. In fact, most of the elegant Bootstrap admin templates available in the market contains a dark theme. From the above-statements, it is evident that the popularity of dark admin templates has considerably increased over the last few years or so. This is mainly because black and other dark color themes are associated with power, prestige, mystery, and elegancy. Such enticing and captivating themes do have the unique ability to capture the attention of site visitors and even encourage them to stay on your website for a longer period of time. This is why several business websites from all over the world use Dark themed admin templates. Some of the best dark admin templates that will make your website look great are the following. The Equinox Bootstrap admin template is one of the best options available to designers who are looking for a multipurpose dark themed admin template. The cross-browser compatibility and easy to customizability of the Equinox Bootstrap admin template will surely urge you to check it out. Moreover, this admin template can be easily customized. The high responsiveness of the Equinox Bootstrap admin template will make your website look great on both mobile and desktop devices. This will in turn ensure a fine website visiting experience to all your customers. More than 10 useful UI components are available with this template and some of them are Tooltips, Typography, Tabs, Pagination, Progress Bar, Badges, Buttons, and Modals. 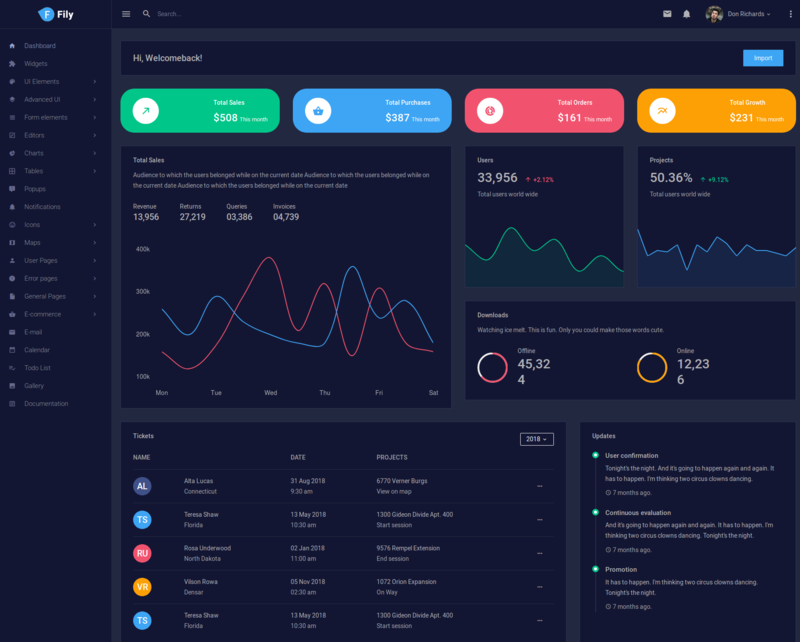 The feature-rich and highly flexible Fily Bootstrap admin template also has an elegantly designed dark theme version. The highly responsive Fily dark admin template comes with a fascinating collection of useful elements and handy tools. Developers who have access to such most modern and innovative tools will be able to easily design and customize websites. Fily Bootstrap admin template that contains both vertical and horizontal layouts is built with the Bootstrap framework, SASS, jQuery, HTML5, and CSS. More than 10 pre-built widgets and multiple numbers of excellent UI elements are also available to designers who choose the Fily Bootstrap admin template. 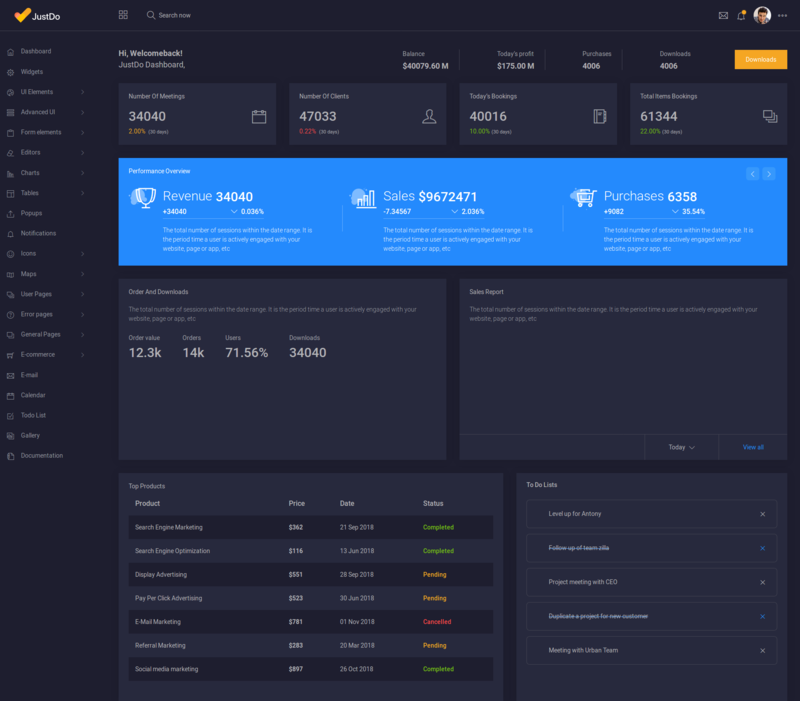 Finding a stunning dark theme admin template that will improve the look and feel of your website may seem quite challenging. If that’s the case, then you must consider checking out the HiliteUI Bootstrap admin template. This excellent template that is packed with handy elements and useful components will surely help you to build flawless websites. The high-responsiveness of the HiliteUI Bootstrap admin template is also worth mentioning because it will make your website look good on both mobile and desktop device. The simple, well-commented, and neat code of this template is actually a lot easier to comprehend even for beginners. 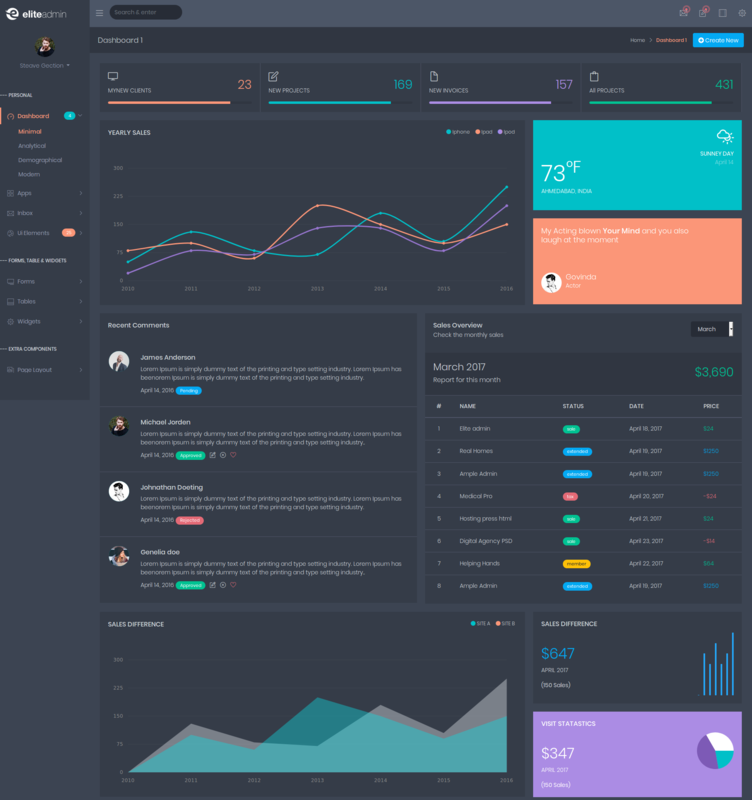 Another best choice for web designers who are looking for an impressive dark admin theme template is DatavizUI. This template offers a wide variety of UI components, along with other essential tools and functionalities. It offers a high level of versatility and adaptability and is easy to customize, which again makes it a favorite of web developers. If you choose the DatavizUI theme, you will get to use more than 10 useful components. Some of these include eight charts, pre-built widgets, four form widgets and a variety of other components. This template is responsive, which makes it work well across all devices, irrespective of their screen sizes. Also, it is compatible with a number of latest browsers. 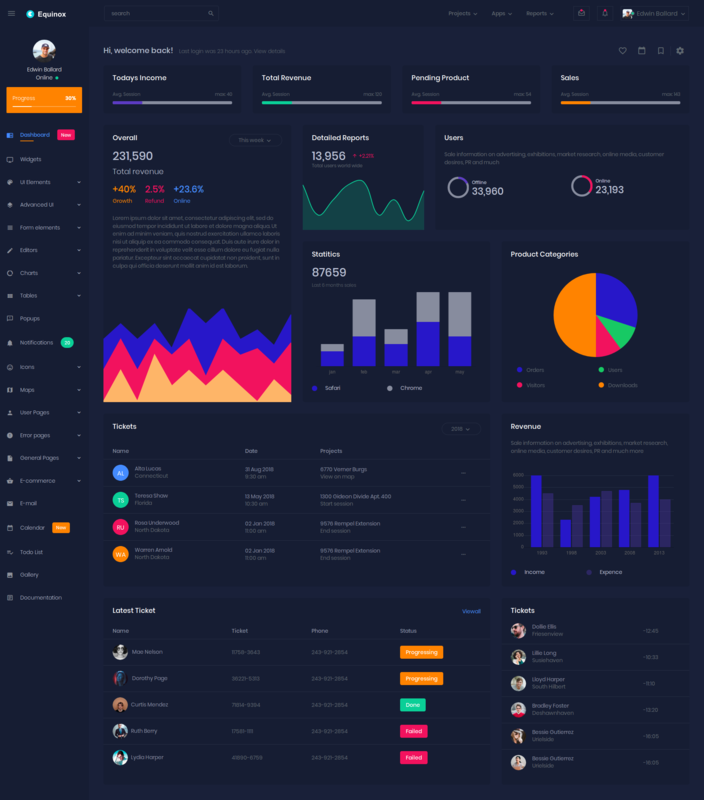 Website designers and developers who are in search of a stunning dark themed Bootstrap admin template that packs an excellent collection of UI elements, components, and other useful tools will get surely impressed with our JustDo admin template. The expert team of web designers and developers at our disposal has put the JutDo template to extensive testing in order to ensure that it meets all the requirements of users. 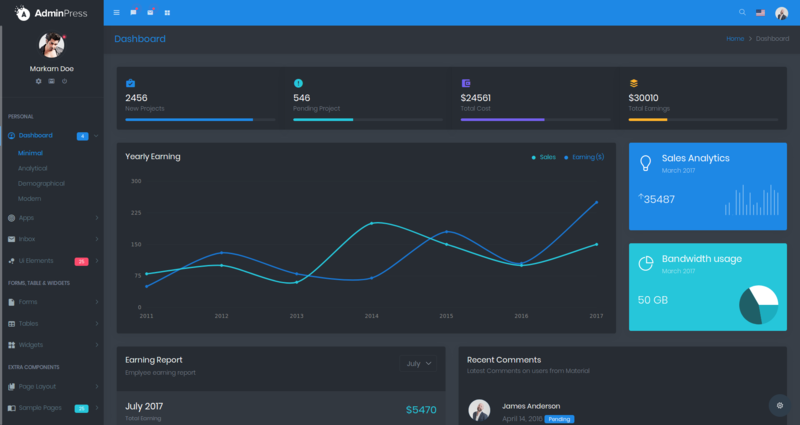 JustDO Bootstrap admin template will give you access to more than ten essential UI elements and 10-plus pre-built widgets. The cross-browser compatibility, excellent support, well documentation, and responsive design of the JustDO admin template will make your website look great and ensure you don’t experience any issues with your site. 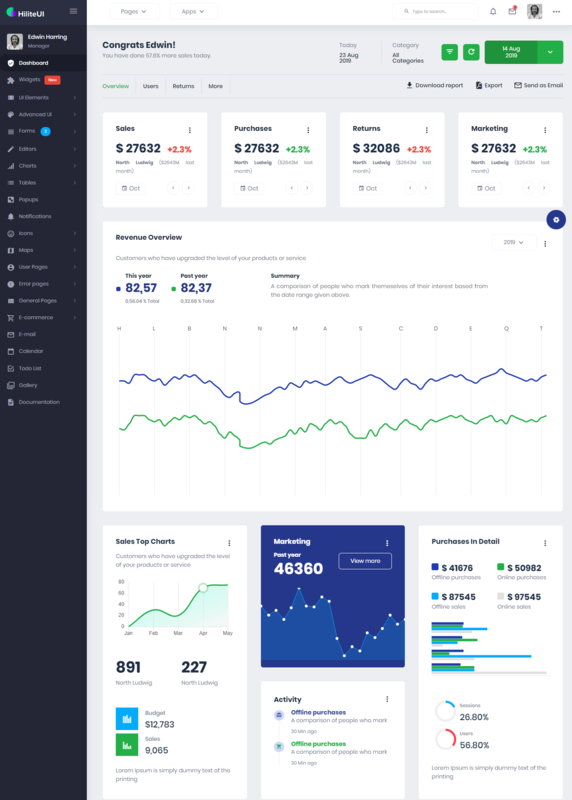 Elite premium admin dashboard template is undoubtedly one of the best choices available to website designers who are looking for dark themed admin templates. This highly responsive dark admin template is built with the help of CSS3, HTML5, and the Bootstrap framework. More than 10 dashboards and 20 separate demo styles are available with the Elite Dark Admin Template. Designers who opt for the Elite admin template will gain access to over 500 UI components and 2000+ elegantly designed pages. The light and dark color scheme options that are available with this template will surely amaze you. Finally, more than 3000 font icons are also available with the Elite dark admin template. The bootstrap premium admin template, Adminto is another excellent dark admin template available in the market. The well documentation, user-friendliness, easy customizability, and several other attributes of Adminto has urged thousands of website designers and developers to choose this template over other choices. This template comes with an excellent collection of widgets and components. Almost all the widgets that are available with Adminto can be used readily and they can also be customized. It is crucial to note that more than 55 pages are included in this dark admin template and that includes Error Pages. The number of Font Icons in the template is estimated to be more than 1700. The dark themed admin template, Vuely is a highly responsive template, which means that websites that use Vuely will look great when viewed from different types of devices. The abundant number of pre-integrated features that are available in the Vuely dark themed admin template makes the process of website building and customization a lot easier. Designers who select this template will be able to choose a dashboard from multiple number of excellent choices. In addition to that, more than 78 custom widgets and over 200 handy UI elements are included in the Vuely template. These tools will help you to bring the desired results to your website with utmost ease. The fully responsive dark themed premium admin template, Admin Press is built with CSS3, HTML5, and the Bootstrap 4 framework. The simple design and user friendliness of this template has made it one of the most popular choice of several developers. Another interesting thing to note is that the Admin Press template boasts an excellent collection of reusable UI components. Four different types of demos and dashboards are included in the Admin Press dark themed admin template. The six predefine color skin options offered by this template will enable you to add a unique touch and feel to your website. More than 700 pages and over 500 excellent UI components are also available with Admin Press. Xtreme dark themed admin template is a highly responsive and well-designed template that is built on the basis of the Angular framework. One of the fascinating aspects of the Xtreme dark themed admin template is that it is equipped with 10 spectacular demo styles. This excellent admin template can also be customized at a rapid pace. If you choose the Xtreme dark admin template, then you will gain access to more than ten different dashboard styles and over 650 pages. Apart from that, multiple numbers of widgets, color skins, and UI components are also available with this template. Some of the popular UI elements included in the template are Cards, Modals, Tooltips, Pricings, Timeline, and Tabs. This entry was posted in admin template and tagged admin templates dark, dark templates.